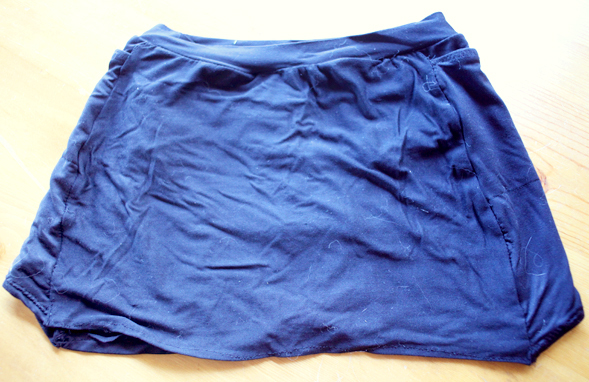 Late in 2010 I attempted to sew a running skirt using Jalie 2796, but I was only moderately successful. By that I mean that I now have a running skirt, but I wouldn’t want anyone to look closely at it. I found it both hard to cut and hard to sew a stretch knit fabric. I’ve gained a lot of experience sewing all sorts of fabrics since then, so I’m optimistic that I’ll do better whenever I get around to trying again. I made the skirt with narrow waistband and the “hot pants” underneath. The latter was because I’d read that the compression shorts end up longer than the skirt. The teeny, tiny little shorts work, but I think I would be more comfortable with something slightly longer underneath. Next time I’ll make the compression shorts, although I might shorten the inseam an inch or so to ensure that they’re hidden underneath the skirt. The pockets are clever, and the skirt is cute. As I keep saying, I’ll likely make another once I find a fabric that’ll excite me into trying again. I’ve made these – except I made a version with knee length leggings attached to the skirt – great for Pilates and just about everything else – the skirt camouflages prominent hips better than just tights for exercise – I love this pattern! Leggings are a great idea! I’ve seen ready-to-wear running skirts with leggings underneath them, but I hadn’t considered it with this pattern since it didn’t come as an option. When you made your leggings, did you just swap in another leggings pattern? Or did you draft a leggings pattern from the pattern’s shorts? Aw man! You sew beautiful things AND excersize! You are too much! Hey – I could fill up a full blog with my not-so-perfect sewing items – that’s how we learn. What a great pattern for my daily walk. I’ve made this pattern four times and really really like it. The lycra seems to be very forgiving of mistakes — I made mine with hot pants too and like that as the compression shorts ride up without gripper elastic. It’s like bun-huggers but more modest. I did several 18 mile runs last winter in mine. Hope you enjoy yours! Four times! What’s your favorite material for making this pattern? It recommends four-way stretch, but I’ve been considering making the skirt portion of my next pair out of something more polyestery /meshy and just grading from the waist down to a larger pattern at the bottom, so the skirt has more room to swing. Does that make sense? Do you think it would work?